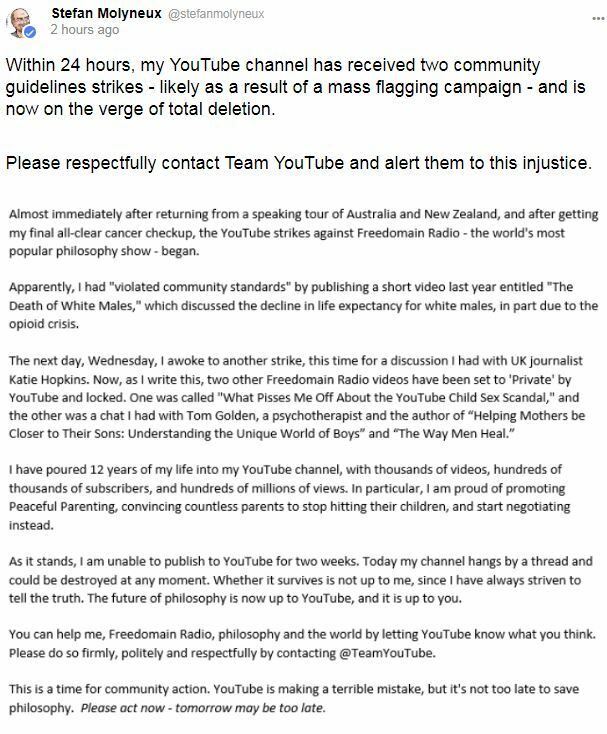 Update: YouTube took back the strikes and restored the account. It looks like my assessment was correct. Stefan reads the same statement here and discusses the culture war taking place inside Big Tech with Alex Jones here. You can tweet a message @TeamYouTube to complain here. As I stated in my Jones post, conservatives and libertarians should already be off of the big platforms and on to Gab.ai, Minds.com, SteemIt.com, Real.video and Bitchute.com where they will not be censored. It’s important to get away from depending on communist controlled media platforms if conservatives are to stay informed. I highly recommend getting a user account setup on all of those services before the rush to join them begins.